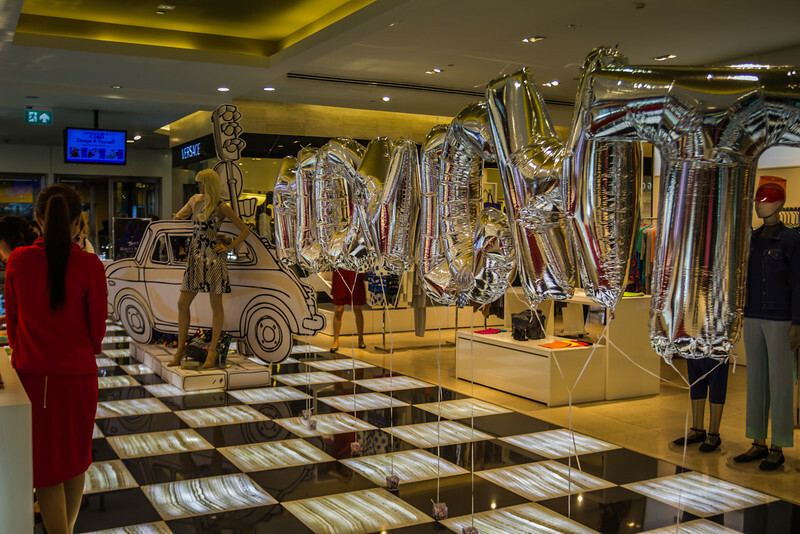 Midnight Sale at Central Chitlom! 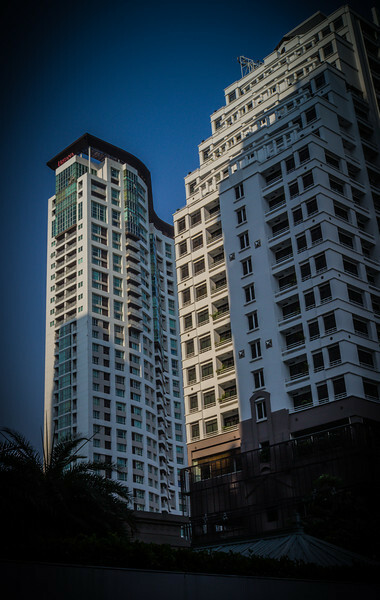 Looking up to my building. Halong Bay as viewed from the top of Ti Top. 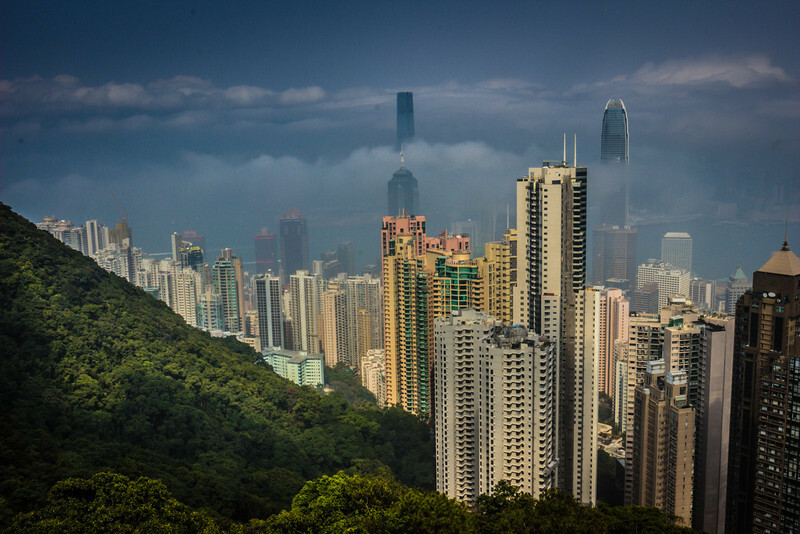 It was a little bit of a climb to get here, absolutely worth it! 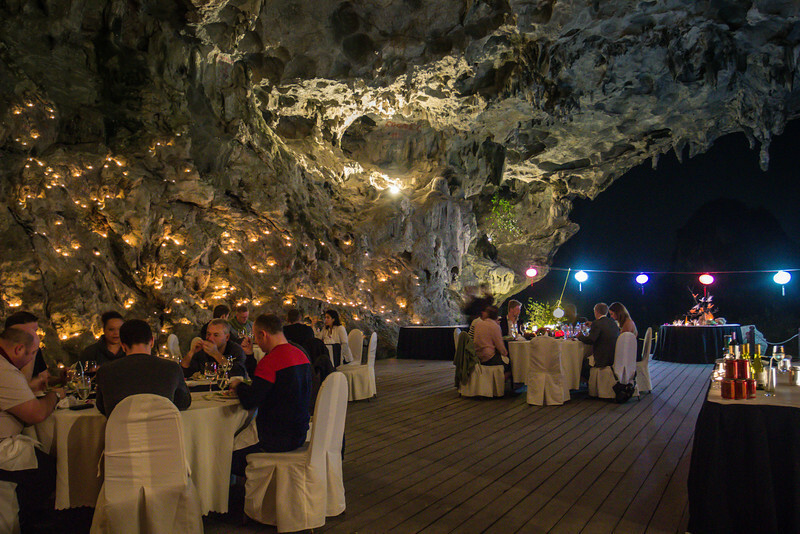 Inside a big Cave in Halong Bay for a candlelit dinner. 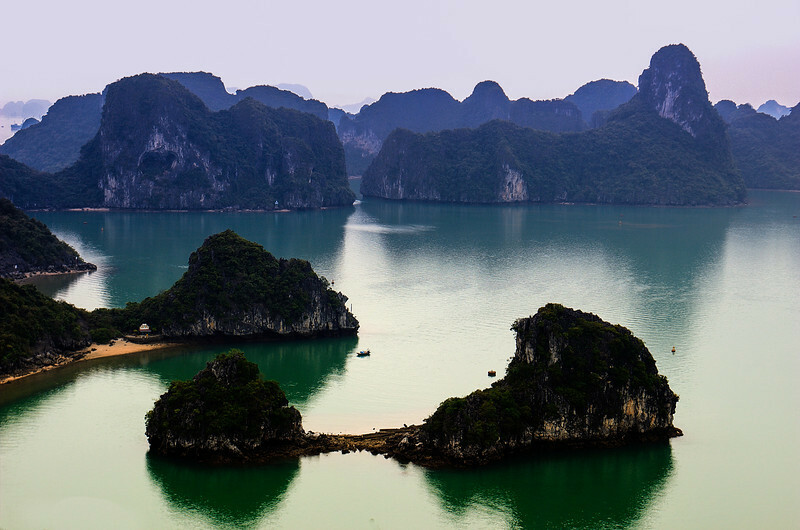 This was simply stunning, if you ever find yourself in Halong Bay you should do this! 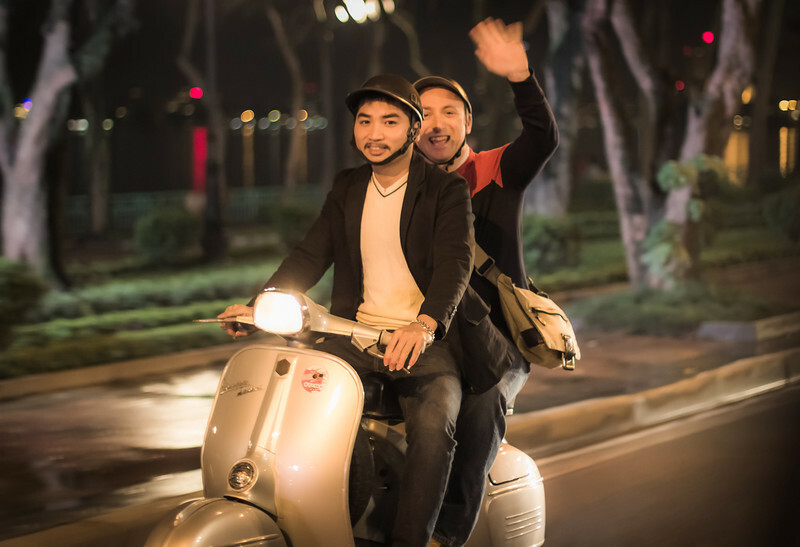 A fun Vespa trip around Westlake in Hanoi. 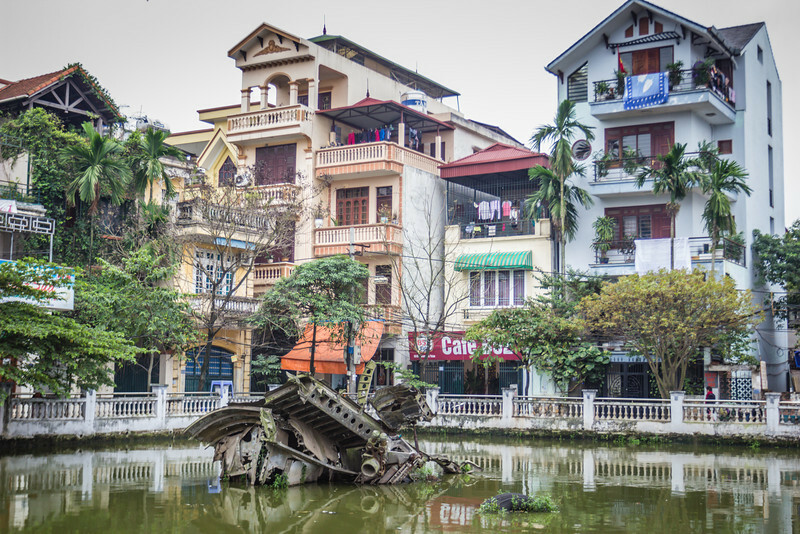 Pieces of a Vietnam war era B52 plane that was shot down over Hanoi decades ago. Left where it landed as a reminder of the long hard fought war against the US. 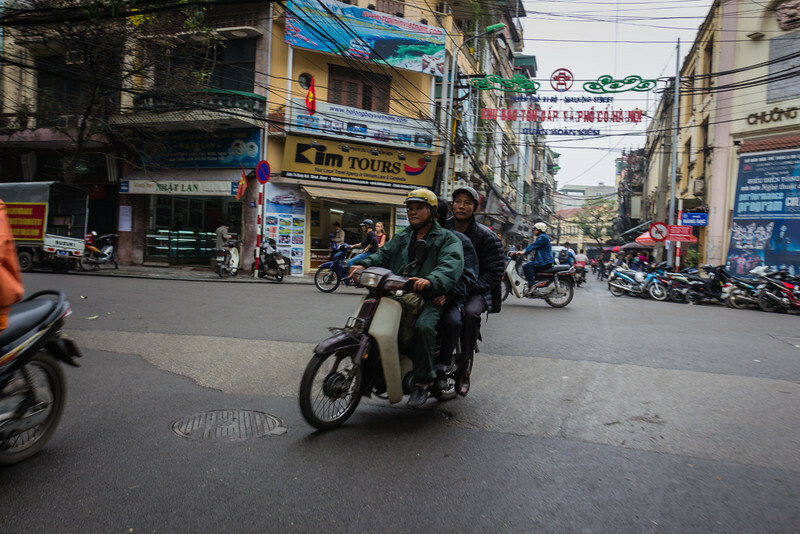 Standard Old Quarter scene, motorbikes with multiple people on them in tiny streets with very limitied room for parking. 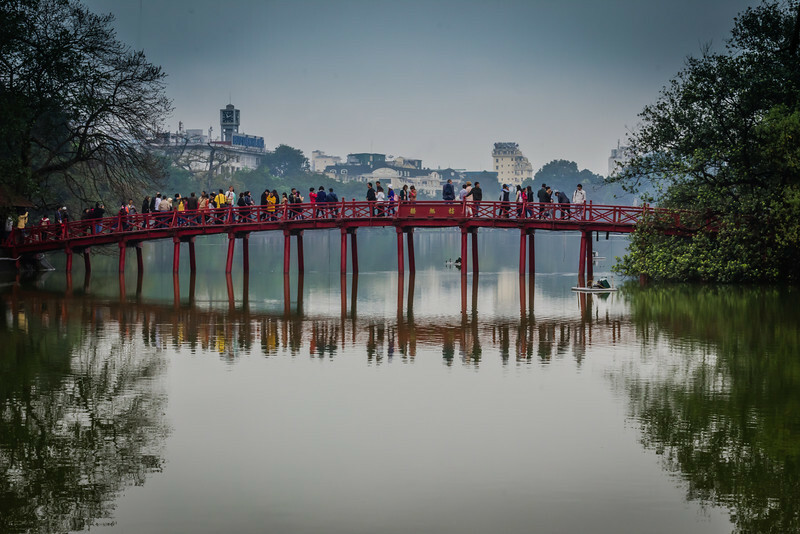 Standing looking out at a fisherman over West Lake and a view of Hanoi in Vietnam. 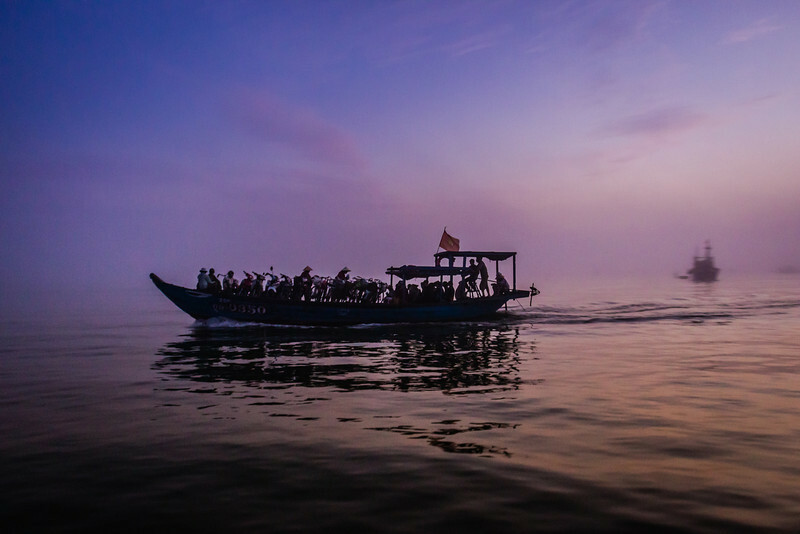 A sunrise photo of a ferry boat (filled with scooters) with a fishing boat in the backgroun. 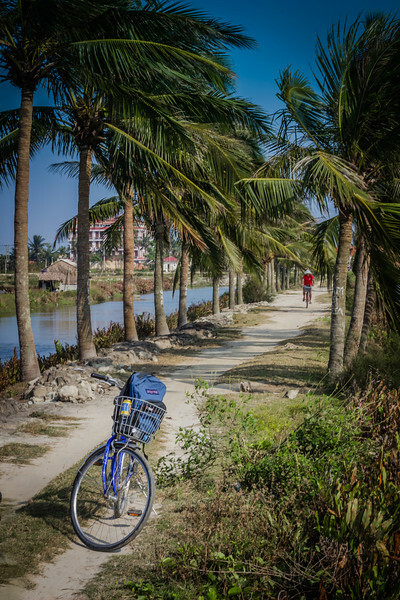 Taken in Hoi An on the way to the outskirts of town to get a close encounter with the local fishing village. 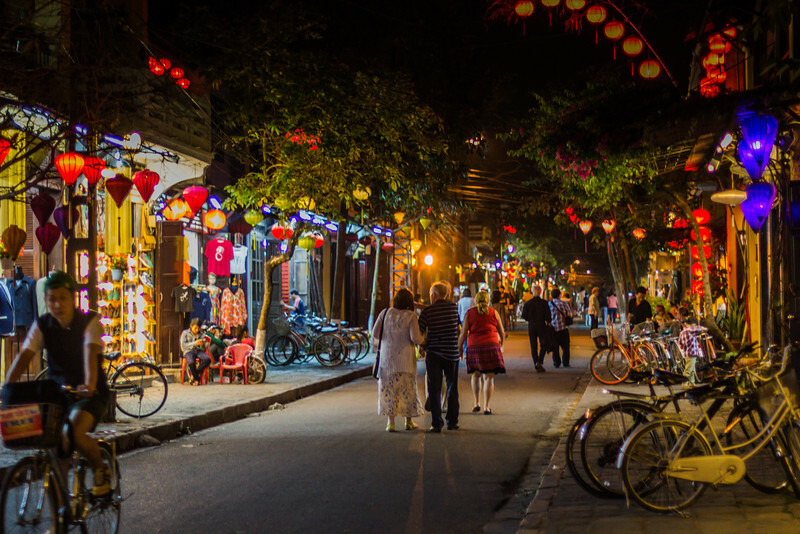 This is in Vietnam, in Hoi An, which is almost excatly central Vietnam. 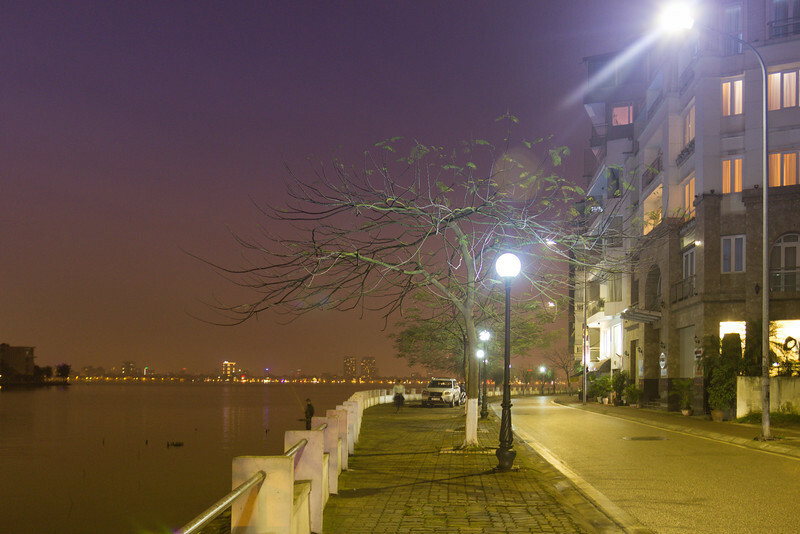 A great heritage city famous for it's yellow houses and lanterns. This is taken in a section where it's pedestrian or cycling only. Traffic in a line, rush hour is everywhere. 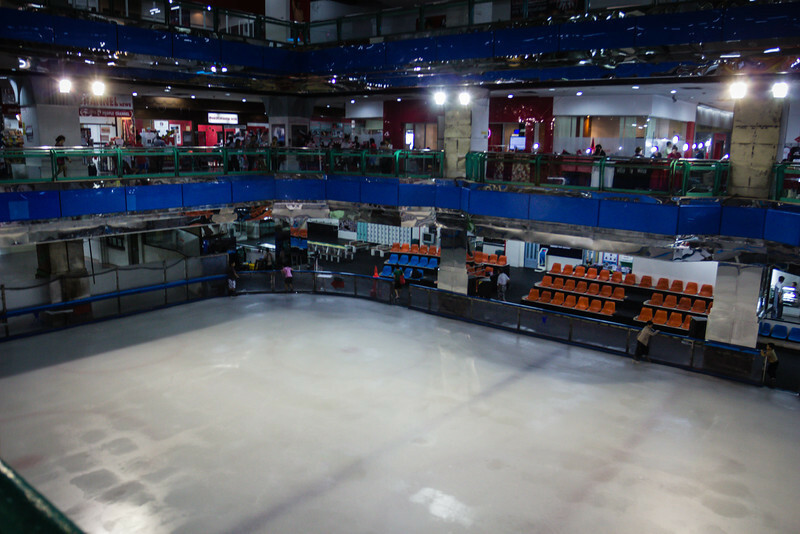 An indoor Ice Skating rink found in Lat Krabang, my first time venturing to this end of Bangkok. 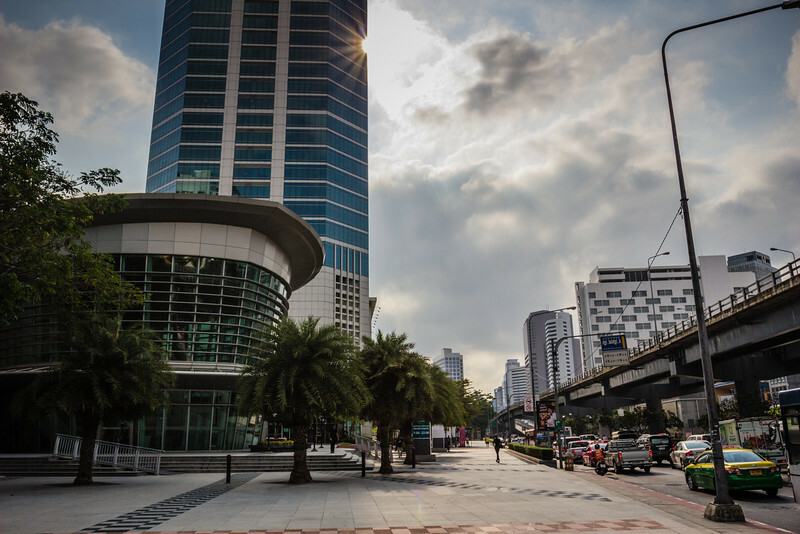 Light reflecting off the building along Rama IV road. Waiting for the train...The lines of the airport link station. 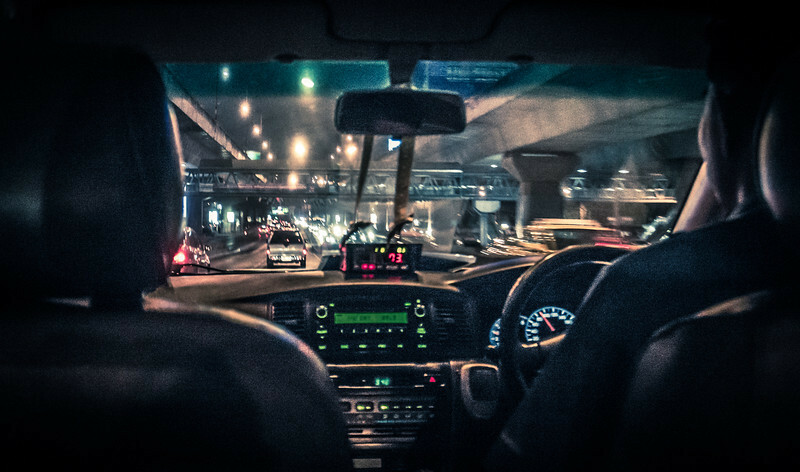 View out of the cab on Sukhumvit Road, the fare is at 73 THB. 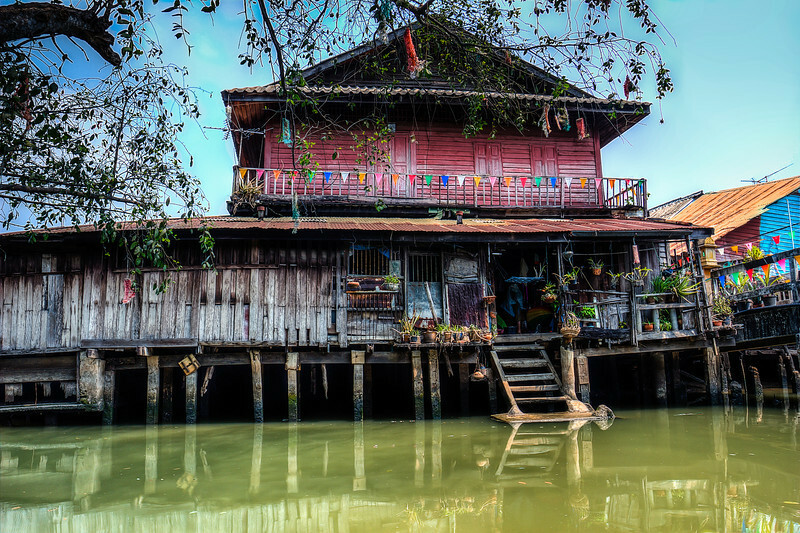 An old house by the river taken at the market in Chachoengsao. 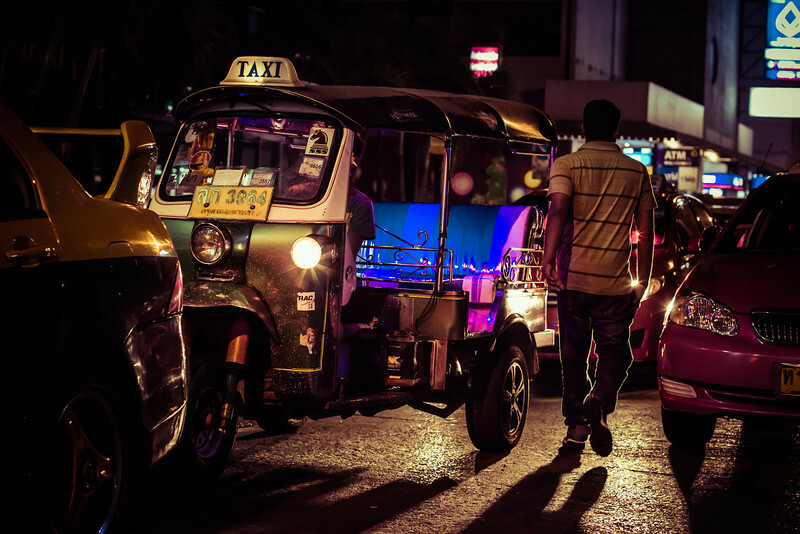 An empty Tuk Tuk waiting to give someone a ride. 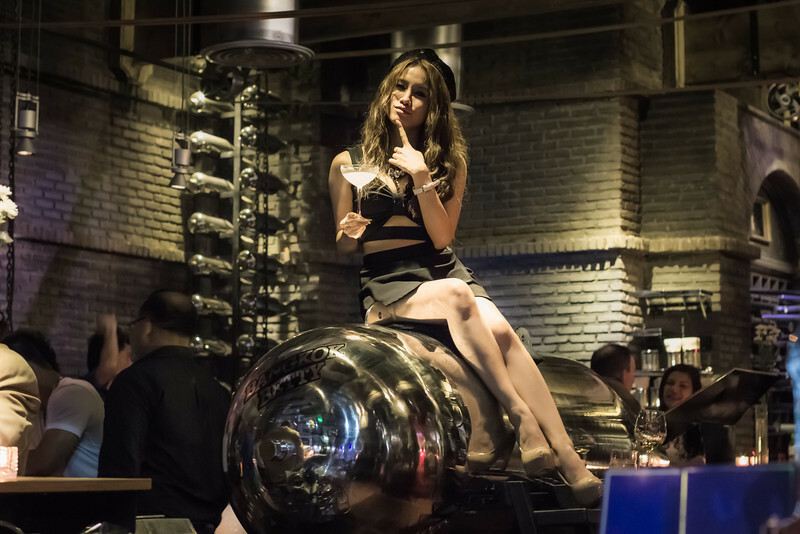 This girl is paid to sit on a bomb (a fake one) and she gets free drinks to look pretty. 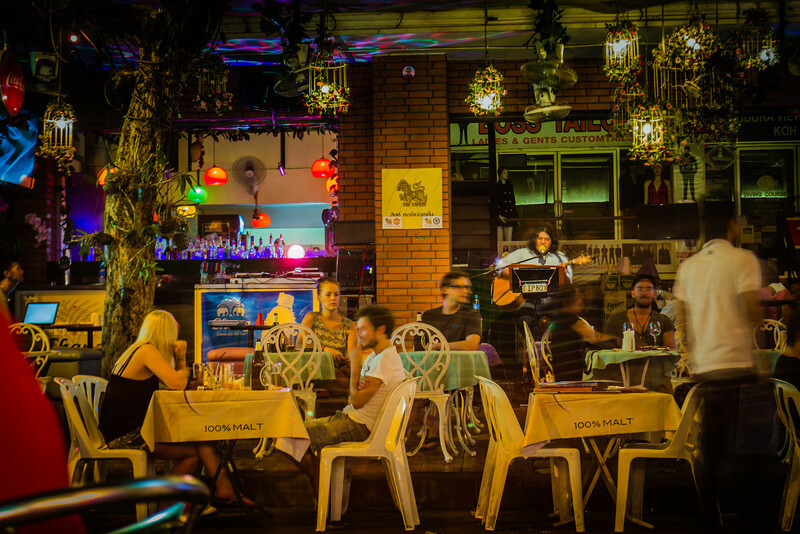 This was taken at Bangkok Betty's in Bangkok, Thailand. This train is so loud, it's on it's way to the country, and runs directly underneath the elevated Airport link train. 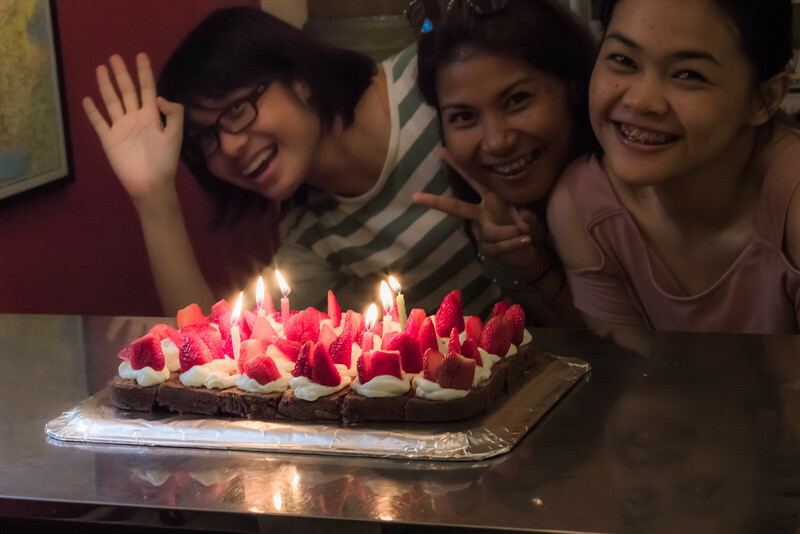 A birthday brownie and strawberry cake for Prang. 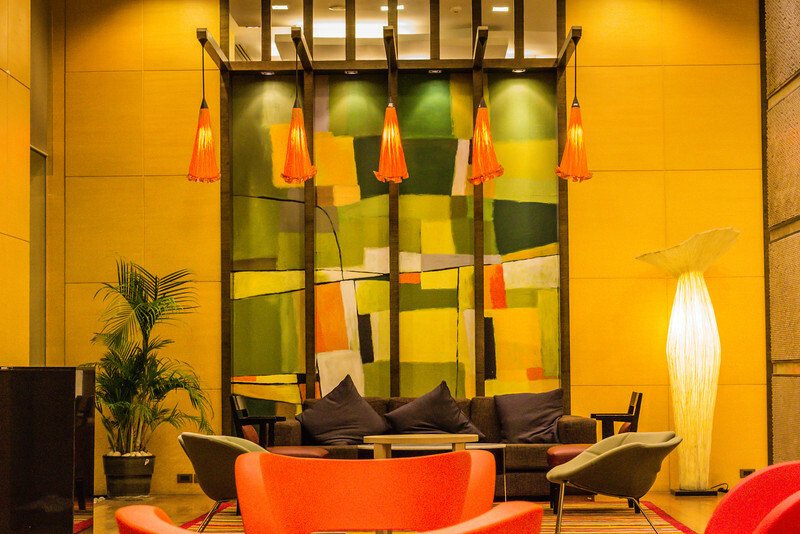 This is from the lobby in my building. 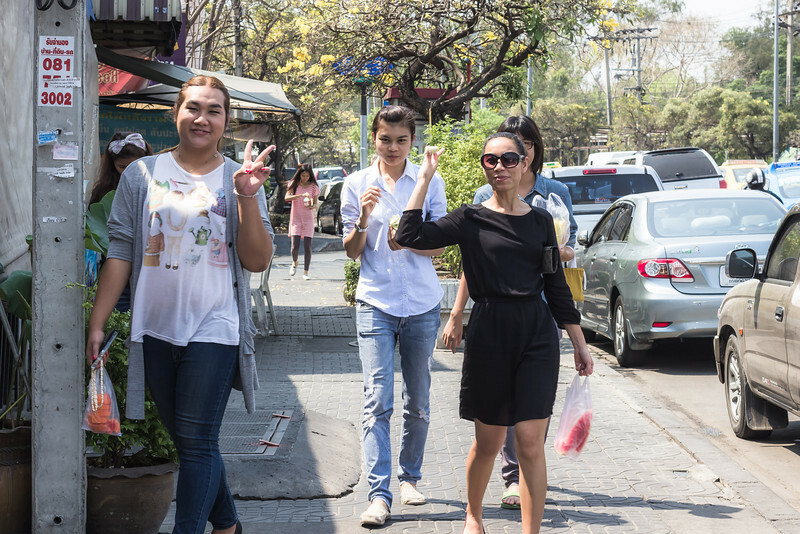 Fruit in one hand, the other hand free for the traditon Thai photo pose. 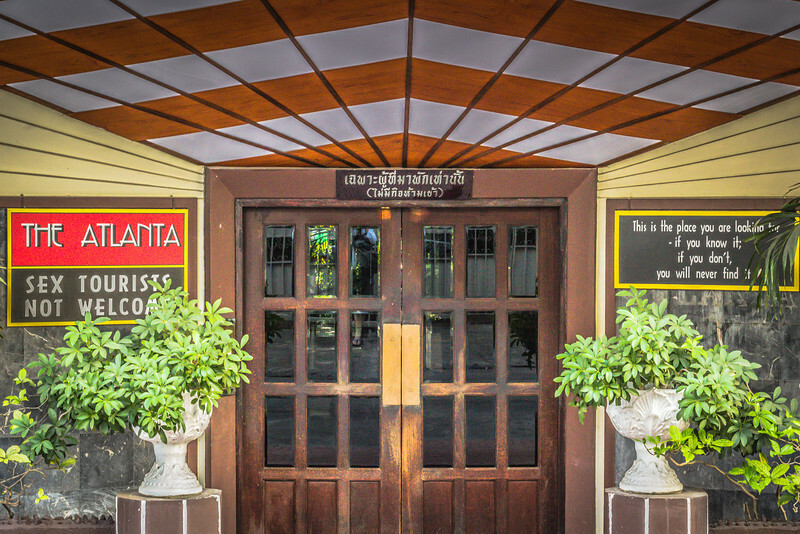 An old hotel found deep down Sukumvit Soi 4, it's called the Atlanta Hotel. I love the interesting signs, this place hasn't changed since the 60's. 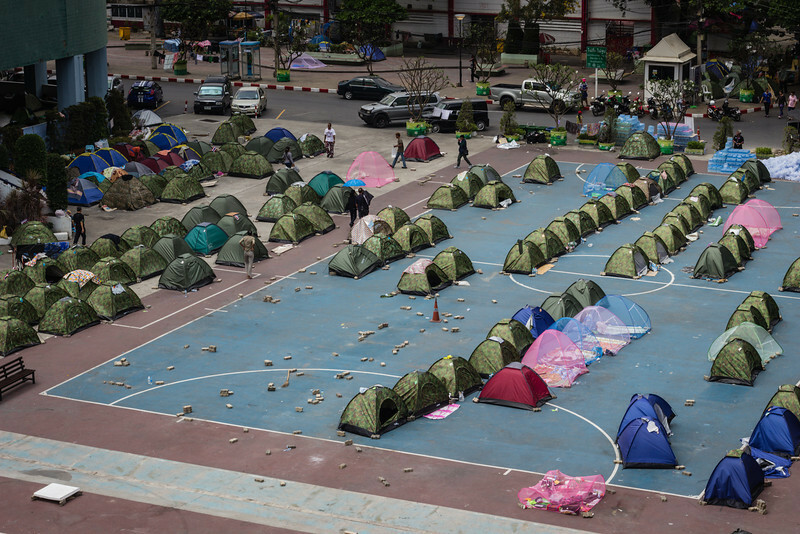 National Stadium Campground, it's been a few months and people are still living near the protest sites. 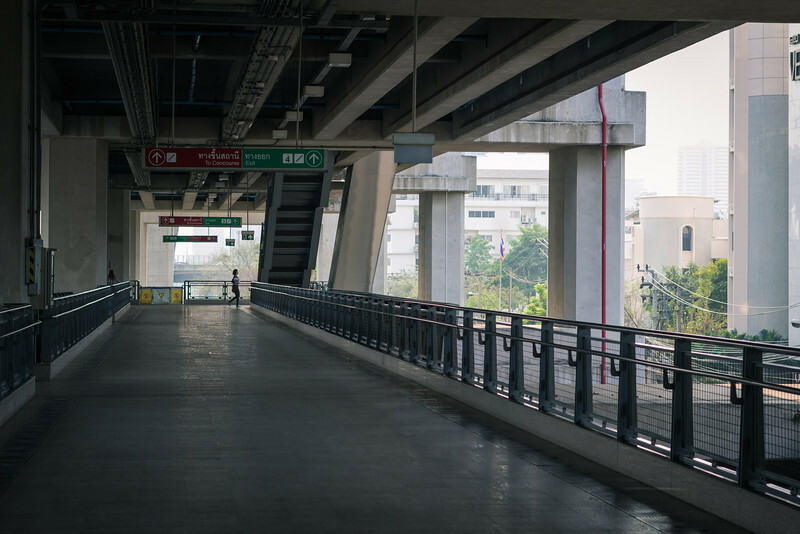 The walkway above the road, and under the Airport link train. 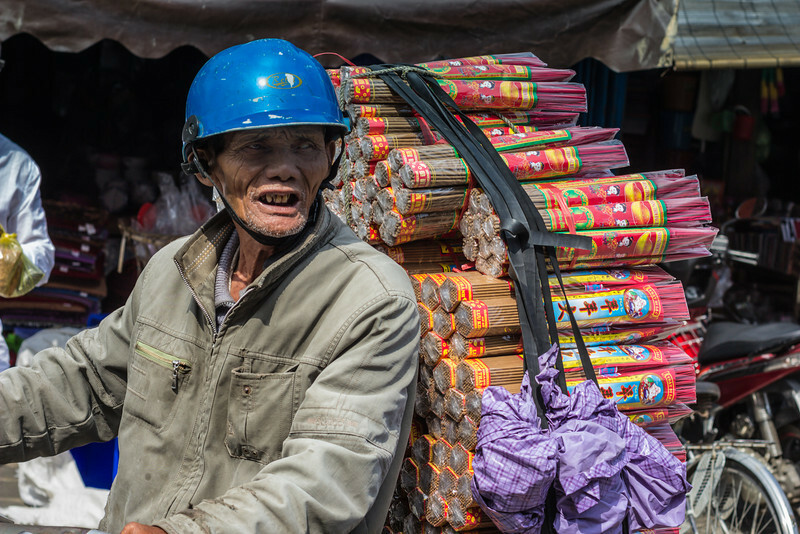 A cart attached to a scooter selling snacks and birds nest. 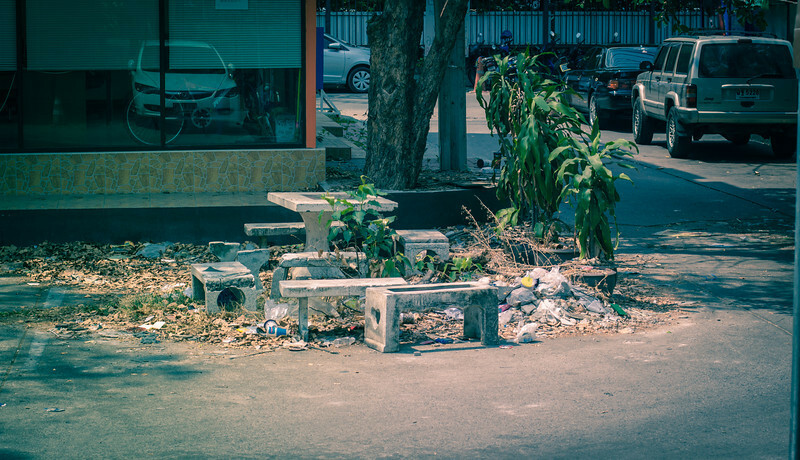 A forgot and overgrown table and benches taking up some valuable parking real estate. 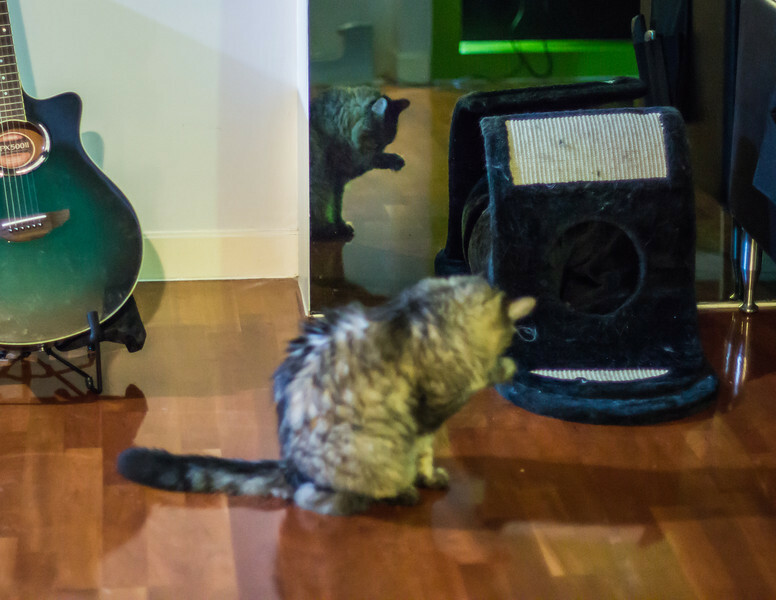 Reflections of Taula cleaning her paw. 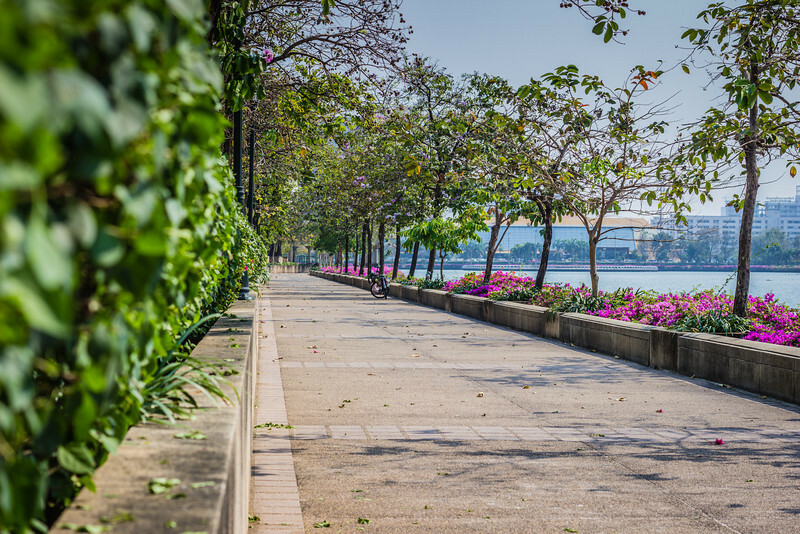 The walkway and the water at Benjakati Park, this is a wonderful oasis in the middle of the core downtown Bangkok area. 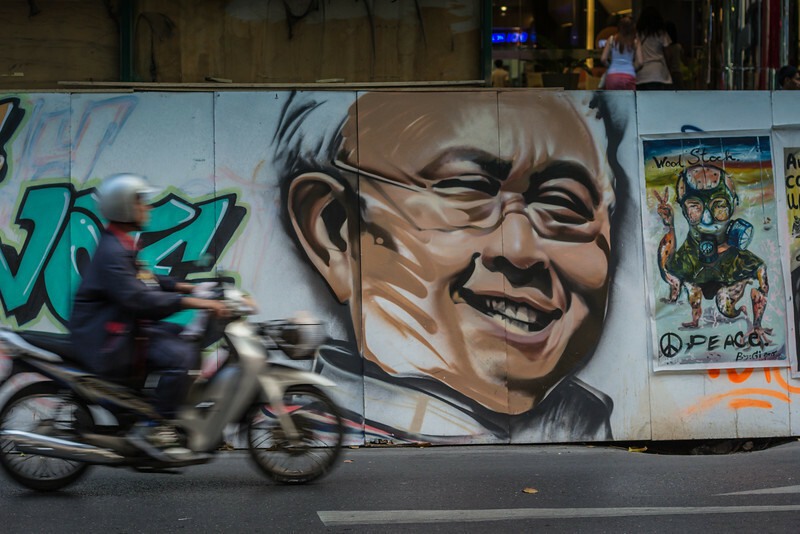 A scooter driver passes a big wooden sign with a handdrawn picture of Suthep. 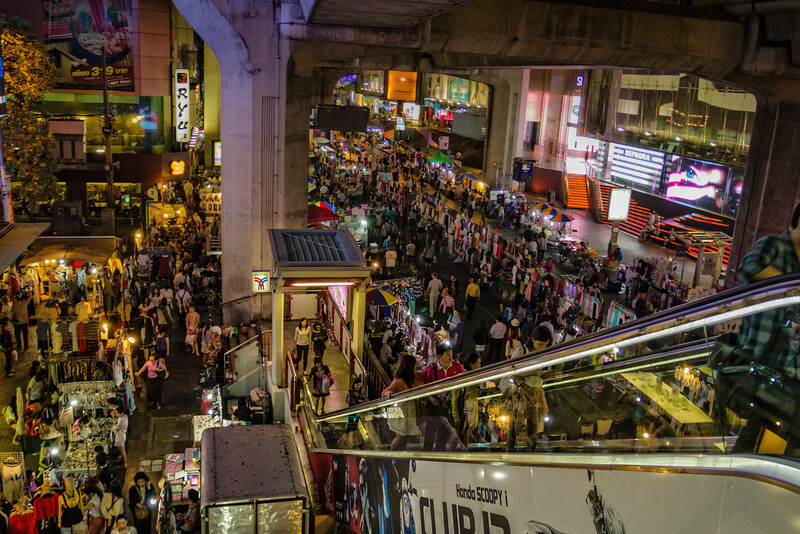 Bangkok Shutdown is still going on strong. 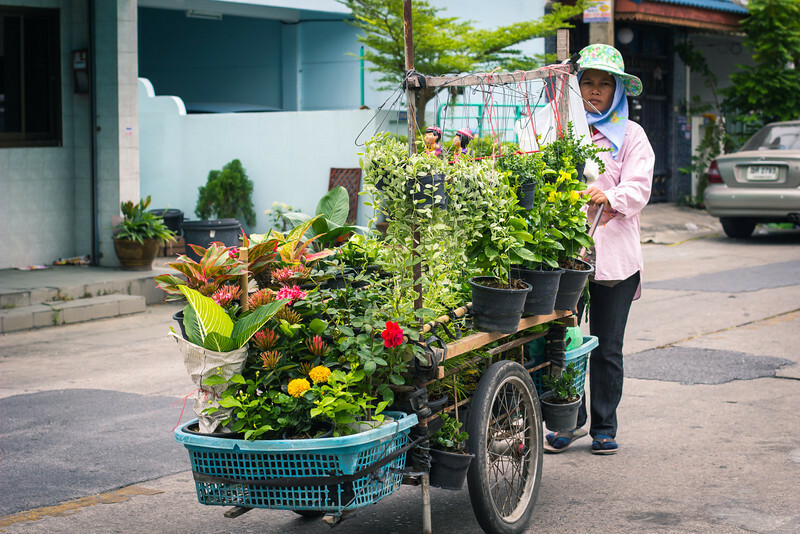 A pushcart vendor selling flowers and plants. With a scarf and a big sunhat on her head she tries to escape the sun. This is some motorbike taxi drivers, all waiting for a fare. They are wearing orange vests so you can easily see them. 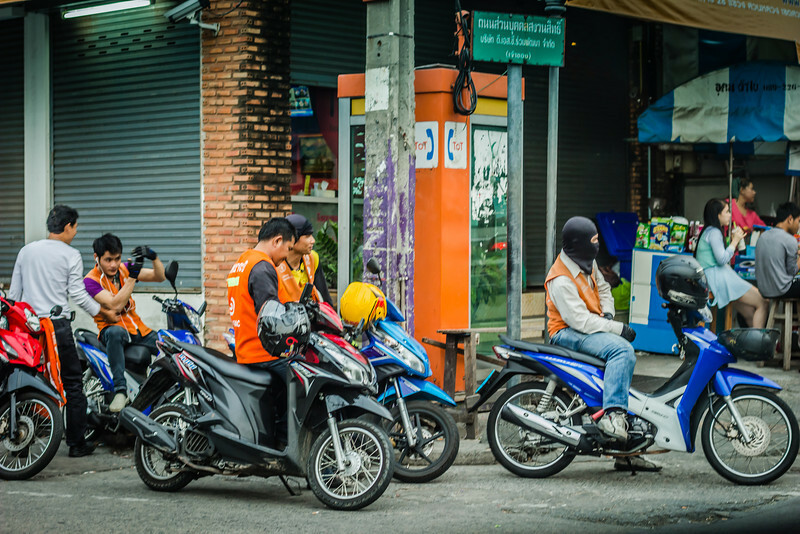 Some people believe that motorbike drivers are all controlled by the mafia, and that the drivers have to pay a fee to wear the vest, and wait in each particular spot to find passengers. 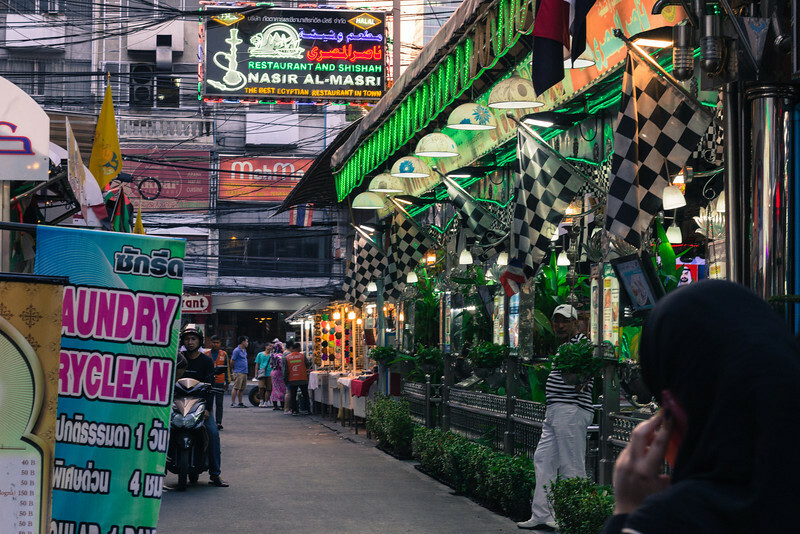 Is this the safest way through Bangkok? Nope, but it's the fastest, I ride one of thees every day. 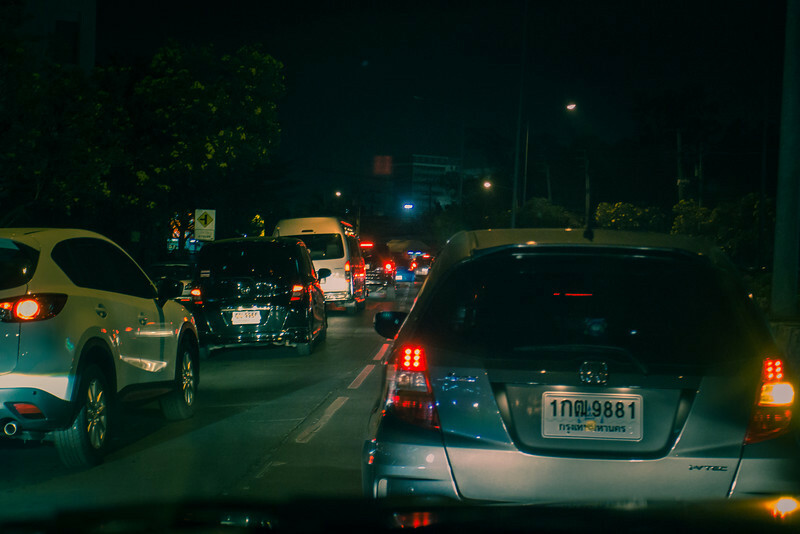 Splitting lanes is the only way to get through Bangkok gridlock. 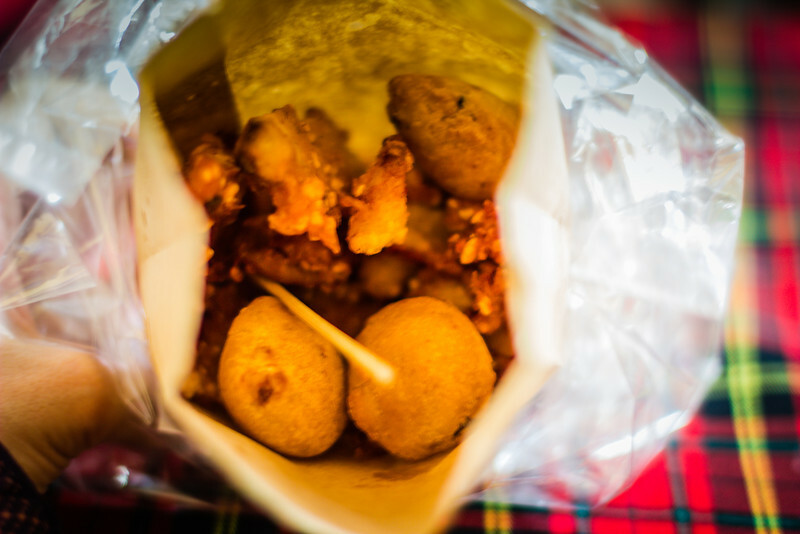 This is deep fried tasty Thai treats. The round ones are potatoe, the flat bumpy ones are bananna, both are delicious! 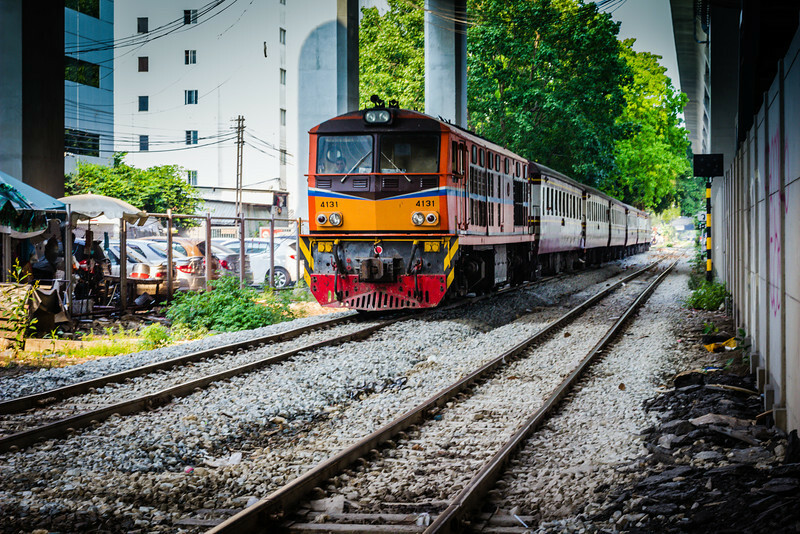 Back in Bangkok, this is taken at Thonglor BTS Station, as on train is in the station, and the other pulls up. 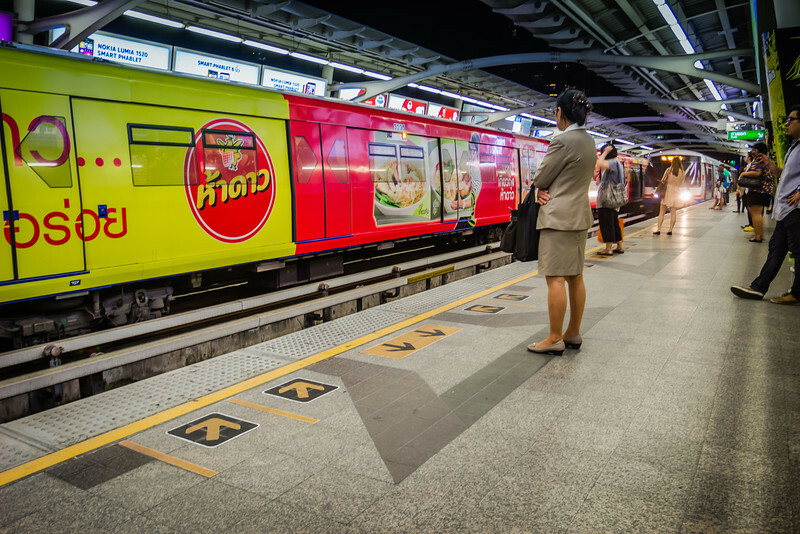 You can see the arrows on the ground as a gentle reminder to get out of the way of those who are exiting the train. 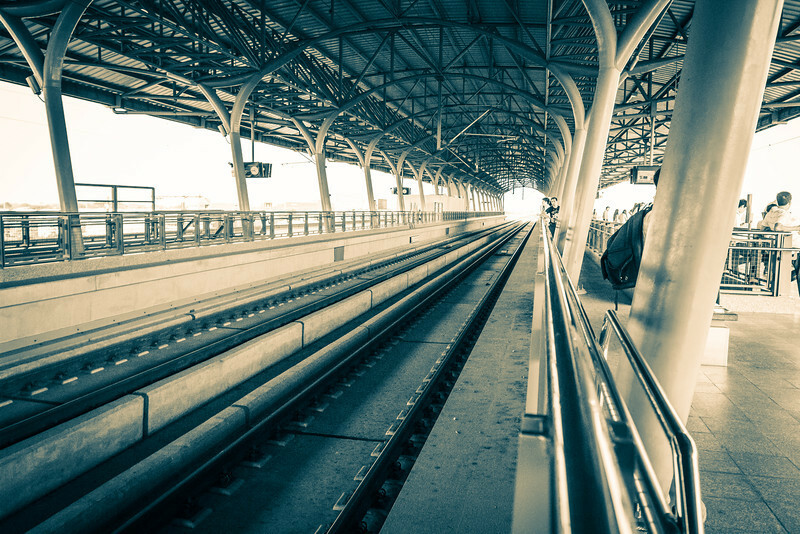 This above ground commuter train system runs above Sukhumvit road, one of the busiest in Bangkok. 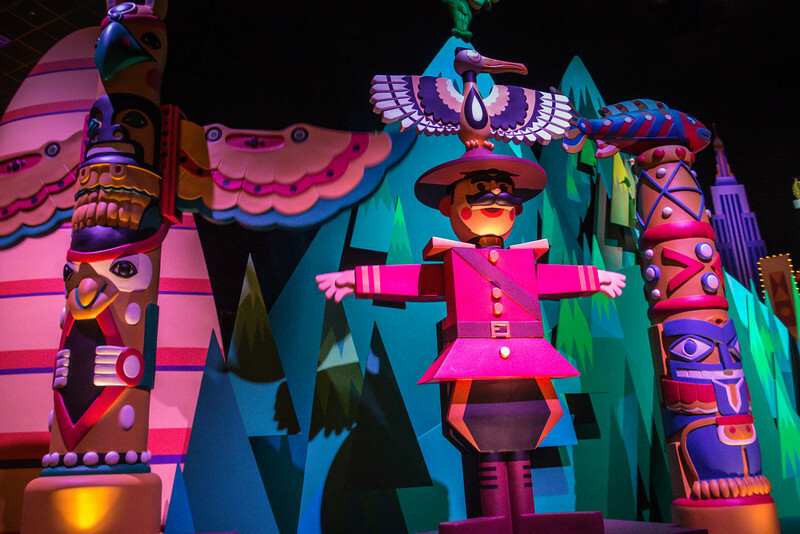 This is the slight presence given to Canada at the Hong Kong Disney, it's a small world ride. Is Canada just mounties in red and Totem Poles? Scooters, cars and overhead wires. 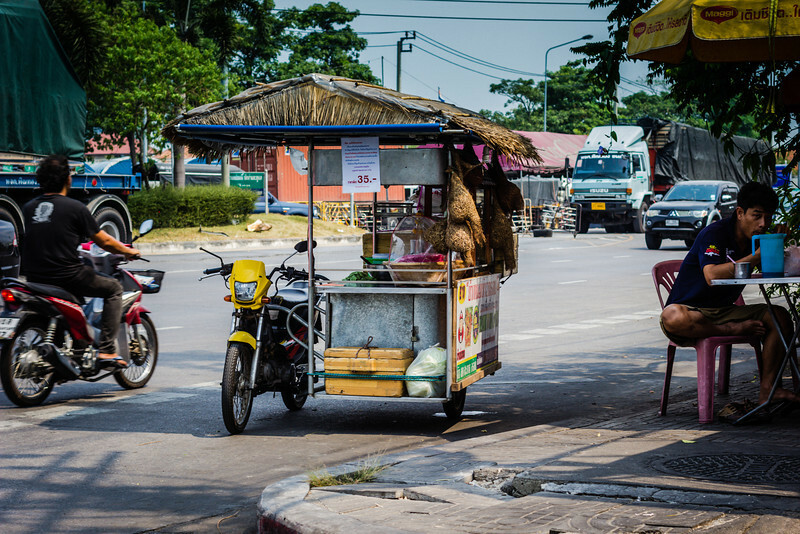 A typical Bangkok street or Thanon in the morning. 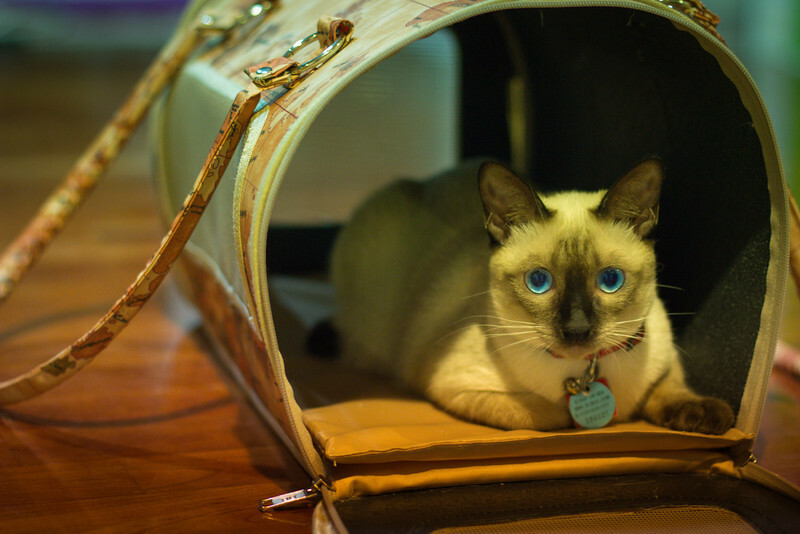 This is Tuk Tuk, a Wichian Mat, Siamese Cat in her carrier. Rama 1 Road just under Siam BTS station. 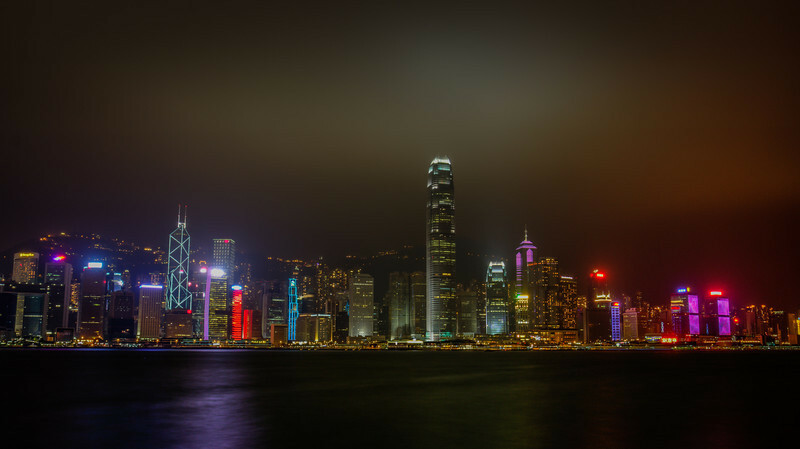 Another place that is still just a walking street only due to the protests - Looks more like just a night market to me. 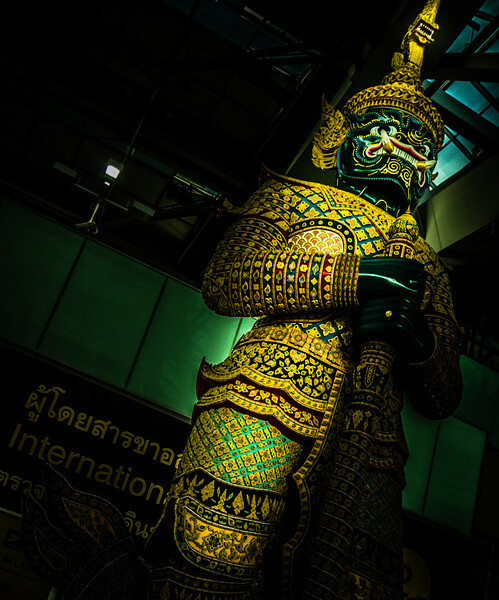 The giants guarding the departure Hall at Bangkok's Suvarnabhumi airport. 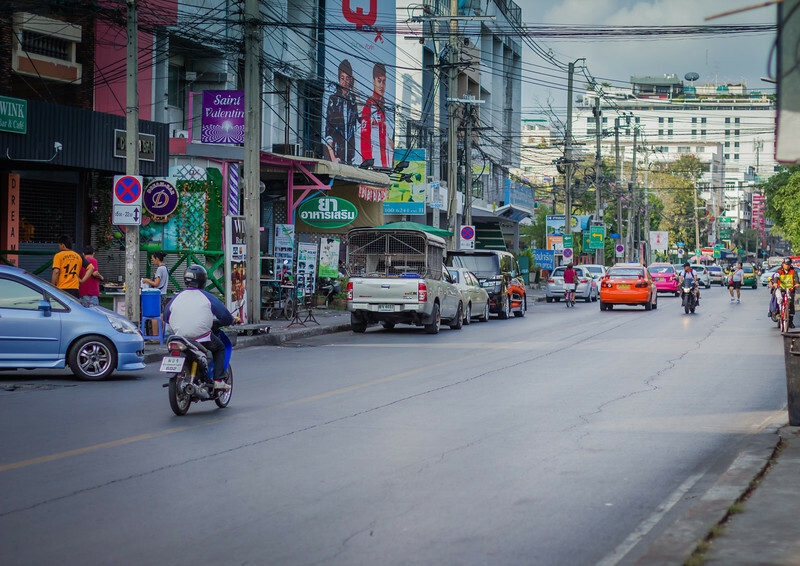 The queue for a motorcycle Taxi on Thonglor street. 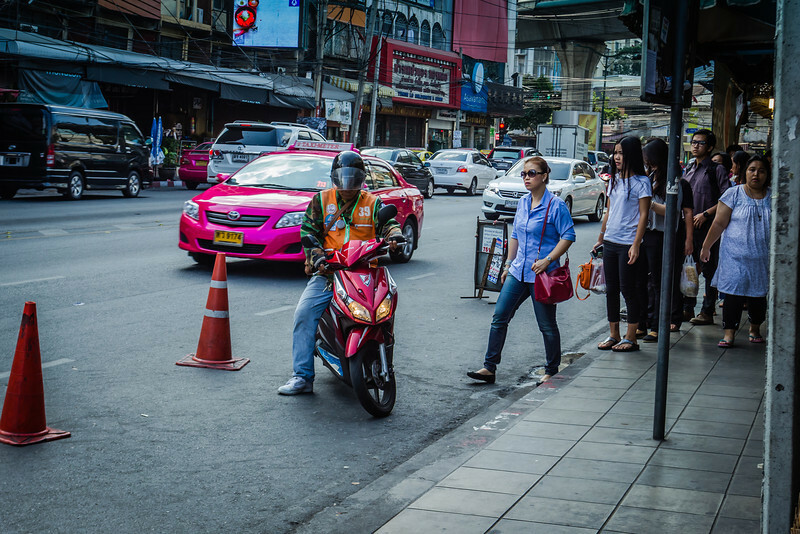 Motobike / Scooter drivers wear distinctive vests (in various colours) to indicate they are for hirer.